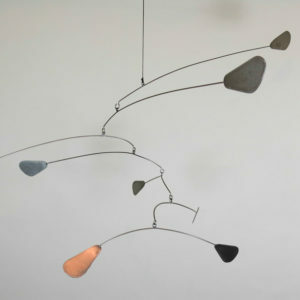 Made entirely from 316 grade stainless steel, and bronze swivels. I used 0.9mm plate for this one to make it nice and light so it moves easily. 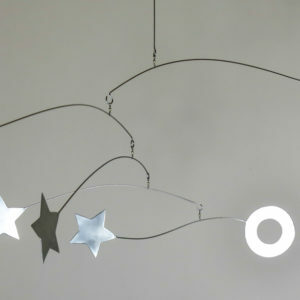 I love how it catches the light and the stars and moon go from bright to dark as it moves! 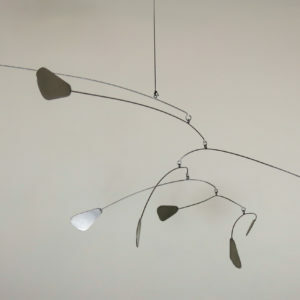 I cut out each element from stainless steel plate, grind it into shape, then sand it with several grits of sandpaper, then weld it to a stainless steel rod, Then I balance each element in sequence, mark the fulcrum, weld on the loop, heat the end to a red heat and bend the hook. Once all the elements are made, I file the welds by hand, and then sand each piece again to a brushed metal finish. 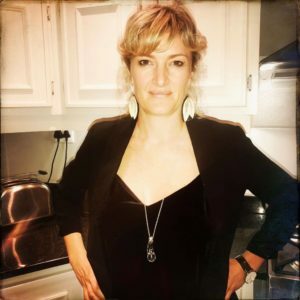 They are very well made, and I like to leave some evidence to the tool marks to show the fabrication process and the ‘realness’ of a handmade work of art. 90cm in diameter. Each star is 7cm across. 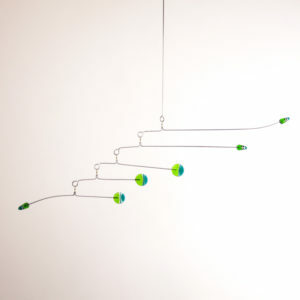 What makes this mobile special, is that each of the stainless steel rods is delicately curved in three dimensions, rather than just a straight rod. 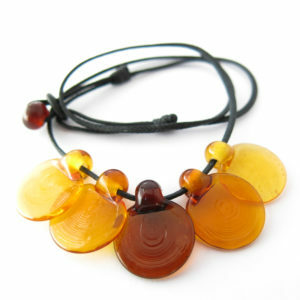 Each curve relates to the one above and below, leading the whole piece to change constantly as it moves. 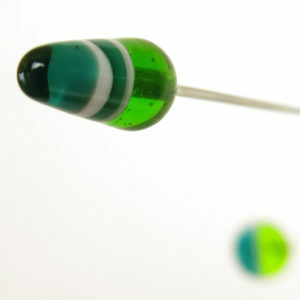 The rods are most often viewed in silhouette, and the appearance of the lines drawn can be really deceptive and surprising: what you think is a bent rod suddenly becomes straight, or one curve morphs into a different one as the mobile moves. 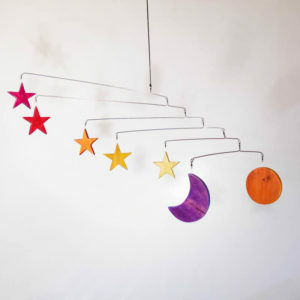 I love the energy and movement in this mobile created by the two curves in the top and bottom steel rods. A totally contemporary addition to a thoroughly modern minimalist household. 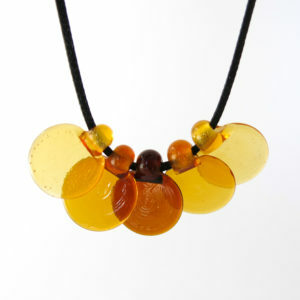 Made from six pieces of Murano glass I created myself in a hot flame. 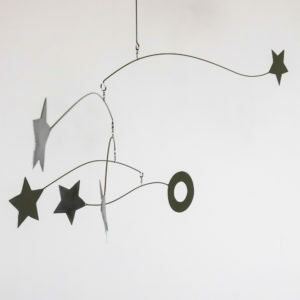 The metal rods are high quality stainless steel and the swivels are brass. See below for dimensions. A gift that is loved by parents and babies alike. 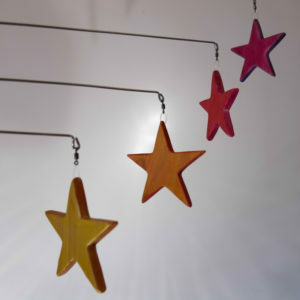 This delicately balanced mobile is made from pine and stainless steel and coloured with Stockmar natural beeswax crayons. 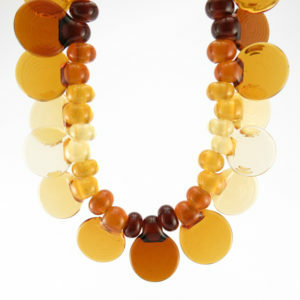 This beautiful necklace contains 73 beads made from four different colors of amber glass. 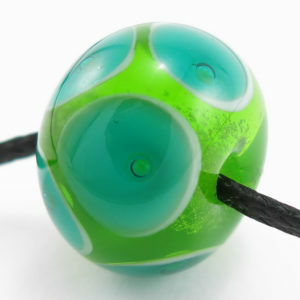 Some of the beads have discs made by adding molten glass and pressing it into a circle with a special tool. This also gives each disc a unique ‘fingerprint’ pattern. 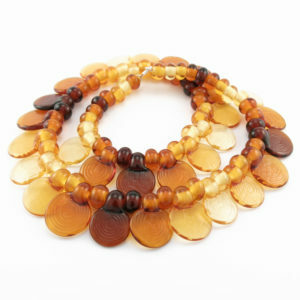 The rich, earthy amber colors remind me of ancient silt, and the disc beads and arrangement are early Egyptian in style. 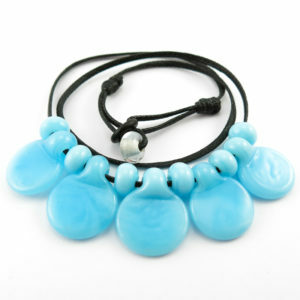 A stunning, goddess-like adornment! Anuket is the goddess of the Nile river at the start of the Nile’s journey through Egypt, and in nearby regions of Nubia. When the Nile started its annual flood, the Festival of Anuket began. People threw coins, gold, jewelry, and precious gifts into the river in thanks for her life-giving water, and returning benefits derived from the wealth provided by her fertility. Amphitrite, sea-goddess and wife of Poseidon, was the personification of the sea itself (saltwater). 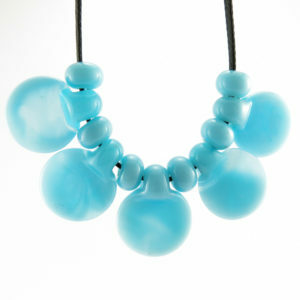 I think this may be the most beautiful necklace I’ve made so far. 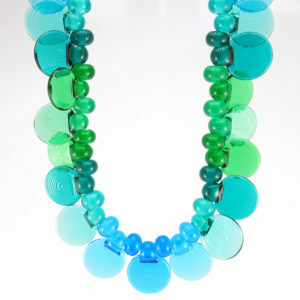 Made from a translucent blue and green glass, it seems to radiate sea energy. 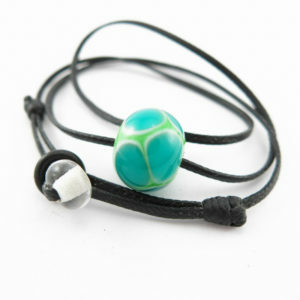 Set on stainless steel cable with sterling silver clasp. 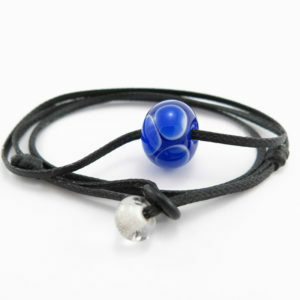 Celestial Aquatics Water Remedy Orbs. 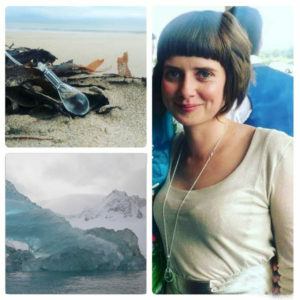 Wearable water orbs for the spiritual being; Water Essences from Arctic Icebergs to the waters of Irish lakes and waterfalls created by Ruth Le Gear and Graham Reid. 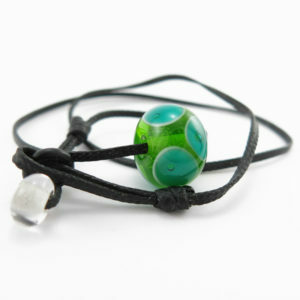 Made from radiant see though glass in the 7 chakra/rainbow colours. 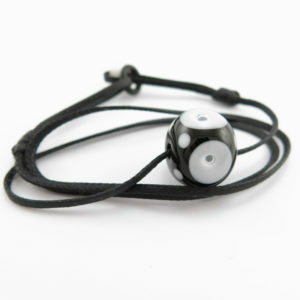 Threaded on adjustable 18 to 24 inch waxed polyester cord, with a glass bead and rubber o ring clasp. 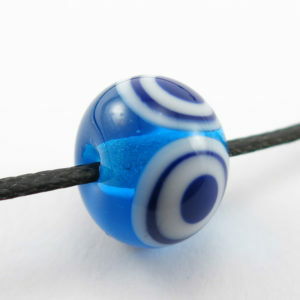 I’ve been experimenting with two-tone drops and love the optical effects they create. 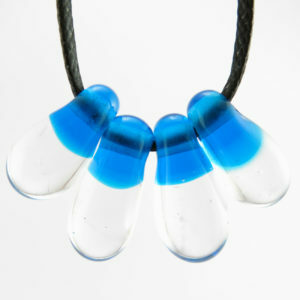 They refract the light in so many ways and can appear totally blue, or clear depending of what angle you see them from. 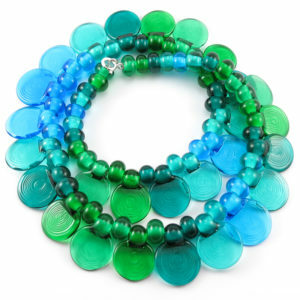 All sea bead necklaces are fully adjustable (just slide the knots on each end) and can also be worn as bracelets (wrap twice around your wrist). 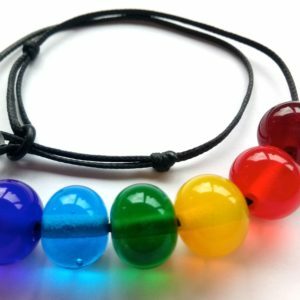 Each necklace is unique, hand made with love, and totally collectable! Like North Atlantic water droplets caught in the light and suspended in time. 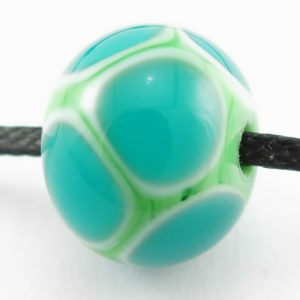 Made from opal “Poseidon” Effetre Murano glass, my favourite glass of all. 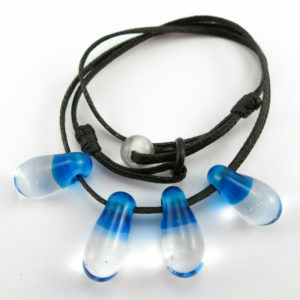 The opal glass’ have such an amazing translucency to them which seems to change with every shift in the light. 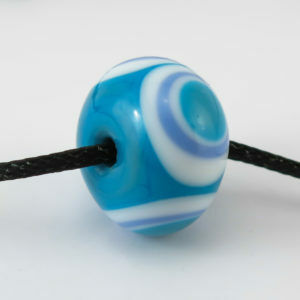 A “Blue Moon” design with a transparent turquoise base, and alternating white and midnight circles. 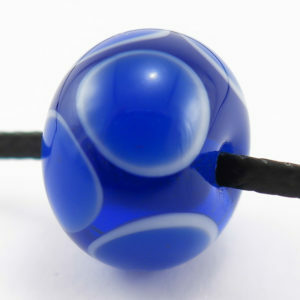 This bead reminds me of the ‘blue holes’ that form in coral reefs, surrounded by deep blue sea. Blue holes are great for freediving. 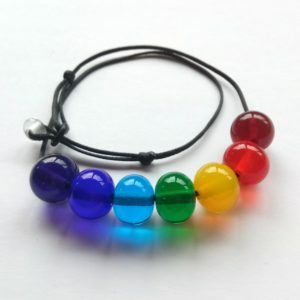 These beads remind me of Orca whales and atoms! 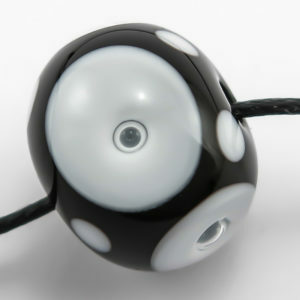 They are black and white with a beautiful sheen and have four crystal clear bubbles orbiting the centre like electrons. 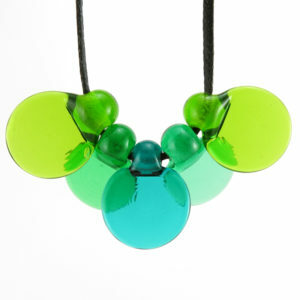 This design reminds me of the colors, bubbles and textures of the bull kelp underwater forests of Sligo. 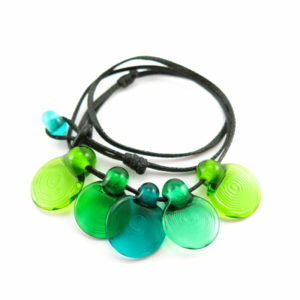 This is one of my ‘green turtle’ designs. I love green turtles, and the fact that they are water-dwelling air breathers.